As always - former GCL Amoeba members are always welcome to post and return! There was a new tool for recommendations that was announced last week that will be referenced. As well, some questions about how you make decisions about purchasing games, etc. 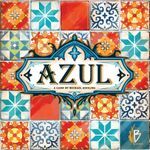 BGG recently announced a new feature where you can click on a link from a game page to find recommendations of other games you might enjoy if you enjoy the current game. When that was announced, someone posted the following link and a number of people thought it provided interesting information. 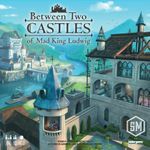 If you choose to click on the link and enter your BGG info, do you think this could be a helpful tool for you? 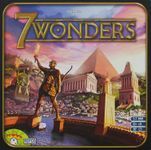 What games does it mention that you think could be of interest? Any that are way off base? 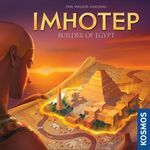 Do you find any reviewers (video, text, webpages, etc) helpful when you are researching whether a game is something you wish to purchase? Which reviewers do you find most helpful? Do you frequently check your geekbuddies to see if they have any perspectives/opinions about potential purchases before making a decision? Do you find the positive or negative comments/ratings more helpful if you do? What is your best/favorite game in your collection that has been pretty universally panned as a poor game; why? And which game that you were sure was going to be a great game disappointed you most? Bunch of online games against the usual suspects. Can't believe I hadn't played in a couple years. I taught two others who were interested in trying the game and it wasn't pretty but at least both found the game interesting and one wants to pick it up. To their credit, they didn't ever starve but it was a near thing for one person almost all game long. This one is always full of tough decisions on what to discard. Taught the same two people whom I taught Agricola this one and both of them also quite enjoyed this one. I won but only by a couple points. She hammered the yellow meeple engine with the djinn that gives 3 points per yellow meeple and did not spend her money/points in the auction. Two player game where I taught the other person. He got off to a fast start but then my engine caught up and got rolling with a point generator engine. Played the B sides for a different experience. I was behind all game but won thanks to end game scoring. Not sure if I've played a game I don't own this many times before. I do find it enjoyable despite the luck of the draw and the very tactical nature of the game. Multiplayer solitaire as well so if you're looking for player interaction, this isn't your game. I don't do well at this one. Not sure why. Our campaign continued to go swimmingly although I had to take on more of a support role this game as my weapons never came up until the very end of the game when it didn't matter much. A couple people wanted to play a couple easy games on a lazy Friday afternoon at work. This was a hit. This was the other one I introduced and it was a hit for one person and not so much for the other. The odd shapes sure do create some challenges in solving the puzzles. Five player game where I was low man on the mountain for a long time but pulled myself up late and won. Asterix game though as some of us were playing with incorrect rules (although I still won using those rules which actually handicapped me). I've mixed feeling about this one. I certainly shouldn't be playing this one at the end of a tiring day. 4 Choose Your Own Adventure: House of Danger x5 NEW! Had picked this one up at EsCon flea market since I was curious. I won't be holding onto it. Definitely feels like a choose your own adventure book that was torn apart and put onto cards with a bit of dice checks put in (a bit of dungeon crawl added with possibility of picking up items to assist you in your different checks). 7.0 Twice As Clever x9 NEW! Most of these were solo plays on the app but I also printed out the file someone created that converted the colors to the colors used in the original game and played a game against Caleb. I like it better than the original and it adds another manipulation option (unlocking dice from the platter). Online play against an AI. 4.0 The Sneaky Snacky Squirrel Game x2 NEW! My daughter has picked up on my habit of checking out the game shelf at our library first...this was her choice...long sigh...................I just love games with spinners and spots that say throw everything you’ve gotten back in the center...no real choices but my daughter loved it. I will never, ever play this game with the purple card that allows a player to trade cards of their choice in the game. 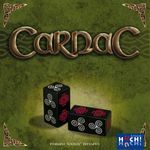 It’s broken, especially when only one comes up...besides, Machi Koro has long since been surpassed by other games of its type. I have zero interest in whatever the legacy version coming out this year. Five player teaching fame where I was the only person to gave played before...unsurprisingly I won but two players were very close and all seemed to really enjoy it. 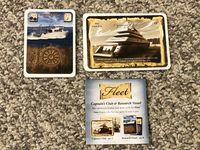 The one who had played Keyflower before actually liked this one better as you always had something to build and couldn’t have a bad round where you were outbid on all the buildings. Taught this to the same group. 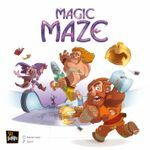 I think the players found it enjoyable but at least one was frustrated that you score your lowest castle...if you are teamed up with a player who is having trouble evaluating the value of tiles for the castle, you are not likely to have a chance to win. 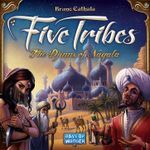 I am curious to try this as a two player game with a Caleb. Scenario 7, and for once we won! It's been tough going in the recent scenarios, so it was fun to have an easier one. The ocelots did pretty much what they should and then stopped doing stuff, thanks to good luck with the decks and some meddling we did. Second game, again a five-player game in less than an hour, but I dropped my rating from 8.0 because, well, it's not my cup of tea really. I don't like how the character cards and buildings work. But since this is so fast, I'll still play this without complaints. Final play. I decided this is just not working as well as it should and could, and I ended up selling this. I think Clippers could be a very good game, but it doesn't always work. Kids like this, and my daughter managed to win two out of the three games, making her very happy. Once the new floor in the house has dried, we’ve been working hard to paint everything before the new vinyl arrives. At my request Jacco brought it to play with me and Natascha. As expected, it was fun, but with our recent experience of a 5p it’s safe to say that more players is more fun. Highlight of this session was not my win (it was tight, with some luck anyone could have won) but building the airship. That’s a really cool model. Natascha challenged me and I underestimated her defensive skills, when I connected two of her Dolmen into the biggest on the board. From that moment on she knew that I had to erect two Dolmen to win and she successfully blocked every attempt and won on the tiebreaker: largest Dolmen. The more I play Carnac, the more I like it. I should raise its raring to an 8. Hard to pick a boilerplate game this week. 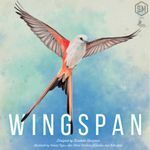 We finished our campaign of Aeon's End: Legacy. It was definitely enjoyable, but I don't think we'll be using the recharge pack that I bought in the Kickstarter campaign. It feels like Aeon's End where your characters grow each game, starting a bit weaker and ending a bit stronger than the regular ones. Happy we played it though! Played the Secret Blueprints map for Age of Steam. I can see why it was on sale - it's not that much fun. Getting cubes to deliver on your own quarter of the map is too luck-driven. Captains of Industry was decent fun, even if we only played it with 2p. The system works fine with this number . 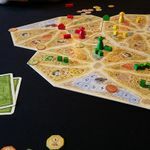 Not very innovative, but a nice build-your-production-tableau game. For the rest of the week we mainly played a bunch of mediocre games. I don't have too many games to report on for this week's list, because I reported on Monday's game last week, and tomorrow's games haven't happened yet. N/A Irish Rails x3 (31 all-time) -- Bob Stribula came up with some tweaks to this crayon rails design, which we already enjoyed, and my wife and I played three games to see what we thought. We liked the changes and think they make the game even better. I'll note that I've already played this prototype 31 times, which is pretty good evidence of how much I like it. 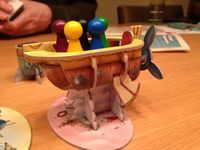 The main question is this: with Asmodee having bought Mayfair Games, what is the future of crayon rails (if any)? 9 War of the Ring (Second Edition) (14 all-time including both editions, which are almost identical) -- Andy Latto and I get together from time to time on weekdays to play longer games, and on Thursday we decided to play this epic "weuro". The last time we played, back in 2017, I played the Shadow, so this time I played the Free People. I had some very good luck. On the first turn I rolled three Character dice and a Will of the West, which would have been enough to crown Aragon King of Gondor on the first turn, but Andy had only one die in the hunt box, so it seemed important to move the Fellowship. I wasn't hit with a bad hunt tile until I was already past Moria, and when I did, it was a 3-damage tile that was perfect for allowing Gandalf to absorb the damage. In the middle of the game I had a drought of character dice just as Andy started rolling huge numbers of eyes, so my movement slowed, but I got lucky again toward the end and managed to win a Ring victory. 7 18EU (23 all-time) -- On Thursday night the Fiscal Group met and we decided to play this game with the Minor Powers variant. It was pleasant, but I continue to worry that there's not much "catch up" in the game; once a player gets ahead, it's hard to stop them. Now, you need to know that in 1822CA, you're going to need a permanent train eventually for every minor you start unless you acquire it with a major. And a major can only acquire one minor per OR. So even if John already had a major, it would be six ORs before he could acquire them all, and he didn't even have a concession. Michael and I were making comments about the Coyote in the Road Runner cartoons and the Acme Company. It was just such an unusual and risky approach. John took it in good humor, at least outwardly, but I don't know how he felt inwardly about our teasing. But how could we not comment on this? Even Joe Huber would have found it hard to play as much of a pedal-to-the-metal game as John was playing, and he doesn't frighten easily. Another thing we teased John about was that he had a 5-card straight: 7-8-9-10-11. We said he'd need to pick up the 12 and the 13 to make it an 8-card straight. Of course, given the fact that the minors are numbered geographically from east to west, John had a bunch of minors that were all close to each other and could help each other with track building (he built track very nicely along the Québec-Detroit axis,) but unfortunately, none of the concessions that were available was anywhere near them, and you need a connection to do an acquisition. Finally he bought the CNoR concession and painfully built a connection from Winnipeg (where the CNoR starts) to Duluth and Detroit. At one point John had the chance to buy the first 4-train with a minor, rusting all his own 2-trains, but also rusting multiple 2-trains that Michael and I were running in our majors (I had the Canadian Pacific running 3 2-trains, a 3-train, and a permanent 2-train for big money, and Michael eventually was running for even more money.) It was clear that one of the majors was going to buy the 4-train, so it's not as though John was going to get another run out of those 2-trains anyway. When the 2-trains rusted, John wound up buying four 4-trains all partially out of pocket (though his minors paid substantial fractions of the cost out of their own treasuries, since they were playing very nice dividends.) After he had those 4-trains, and once he was able to acquire a few of the minors, his dividend income was paltry, but he had huge income from the 50% payouts of four minors running between Ottawa and Detroit. The gravy train ended when Michael finally bought an E-train. Then John had to shove a 5-train into one minor and simply buy it from one minor to the next, earning no revenue with it, for several operating rounds until he could complete all the acquisitions. When we totaled the scores, it was Eric $24K, Michael $20K, John $17K, which was much closer than I would have expected between John and the other two. And if he had bought that 4-train with a minor, I think he would have been right in it, because doing so would have been very costly to me and somewhat costly to Michael. I love it when someone takes what seems like a crazy strategy and makes it work. Even if they don't win (as John didn't,) if they demonstrate that it might be viable, it's great to see. So this play gets my "most enjoyable play of the week" award. Sizzling hot over the past week, so we should have been inside playing games. Instead it was all about the sport - it was hot on the lawn bowls green, but not as hot as watching my son playing cricket. Never seen him sweat so much. Played the basic game solo and won a marginal victory with 58VP. Very quick, some good Ideas cards out early. Really enjoyed it. My Vassal game is entering the competitive stage, so we're all quickly turning on each other. That too has been a good learning experience. One more solo game using the basic and another multiplayer advanced game and I may be right to rate the game! Everyone loves it. It's so quick and the kids can play too. 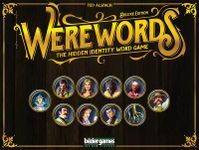 At the moment the Seer has been picked out by the werewolves in three quarter of our games. Obviously need to improve our Seer strategy. Insanely easy, but still quite a bit of fun. I've never played the original. I went for the rush ahead strategy without purchasing the Mosque cards that give you ongoing advantages. Caught me up in the end. Won it again with 19VP. Found the secret is to get early VP buildings and just work towards achieving the VP, then maxing out glass and brick. I just love the role selection in this game. Awful game. My daughter is unbeatable, which gets Aidan fustrated. He's not quick enough on the hand slamming. It drags too. I'd love to get rid of it, but Rosa would be too upset without a game that's an auto win. I got hit by the guard four times in a row! Also enjoying my online games of Labyrinth, even with the threat of a three deck win by Chris! Jon went way too deep in a couple of auctions and was sitting cashless for too many rounds. That meant it was between Pam and I, but unfortunately she had too many interests to try and protect. We didn't even do final scoring when I had five of the six scoring houses and no presence in the unfinished row. 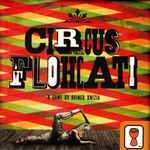 Been crushing out games over at boardgamecore. In one two player I got caught pretty bad. Normally I keep an eye out for Eshu tricks, but missed it this time and was pretty much locked out of the game. When someone takes a first turn Rain Ceremony, I defend against Eshu. Somehow I convinced myself I was fine, did something else, and got skewered. I'm only thirty games in, but I'd love to hear when Dziva is useful. Every scenario I can think of is so convoluted that I don't see it ever happening. This game has been going on for months on rr18xx. I can't access the scores at work, but I came in second. I tend to do better in 18xx games with strict tile restrictions. I typically fumble my way through the stock rounds hoping to not get caught in the next set of ORs. Track restrictions are easier to visualize and I tend to do better at 18xx games where they're more prominent. Played two games with newer players online. Both games they got swamped in their own pollution while I had second cities to spread my filth without worry. One of my coworkers bought this game and wanted to play. He doesn't play board games, but tons of RPGs. The theme attracted him and he's been wanting to play for a long while. He got caught with Blockade, didn't understand why De-Stalinization was so strong, and a number of other first time mistakes. I really like this game, but it probably suffers the most in terms of "experience disparity". It's been months since I last played, and it showed. I got crushed pretty good. Both were three player games that I was sucking tail pipes the entire time. I was always a turn behind playing catch up. Both filler games while we wait for Pam to put the kids to bed. Jon picked up some expansions for the game and wants to try them out. I didn't feel like reading the rules so we played the base game with three. All three games they let me go all in on something with a small sprinkling of other paths. If you let someone take home a couple military points, some blue buildings, and 41 points in science, you're not winning, ever. 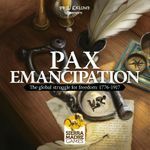 3 Dual Powers: Revolution 1917 NEW! An abstract with a theme tacked on. The random elements don't add anything of merit. At least the game plays relatively fast. Lucksacking the final scoring destination was pretty much the auto-win. 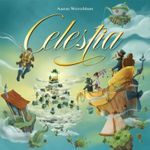 Jon is going out of his way in an attempt to buy every Wallace and Knizia game. I've played many games with auction mechanics and this one falls flat relative to the rest. A game lasts 15 minutes so it's not long, but I'd rather play For Sale. A relatively light week of gaming, as I've been nursing a sore neck. Stupid muscle strain. Friday night, though, I got together with the couple with whom I play Gloomhaven and we beat Scenario 18! Just barely. The other 2 characters were exhausted, and I beat the last baddie with my last 2 cards before I went exhausted. It doesn't get any closer than that. The best part was our tinkerer having the vein throb in his forehead because I wouldn't take the treasure chest in the room because my personal goal was Indigent (loot no coins or treasure overlays). Look, I realize it could have something good, and 2 checks, man, 2 checks! Saturday we started off with Endeavor: Age of Sail. I liked the original game, although I haven't played it in ages, and was happy to give this one a spin. The only thing I ever disliked was the set-up time. And we experienced it twice, because there were 5 of us, and it was accidentally set up on the 2-4 player side. While I enjoy the game, I am still not good at it, and I did not win this one. I fell prey to my usual problem, not getting governorships. Still, it was fun, and I hope to get more plays in. Next up was Architects of the West Kingdom. This was my 1st time playing with the "advanced" boards, and I had Ada, who starts with high virtue, but no cash. I figured "Okay, a Cathedral building strategy." Yeah, well that was good in theory, and 2 players raced by me on the way up the cathedral. I was trying to get cash early to make up the deficit, and also did some poor planning on builds (I should have waited) and fell way behind on the cathedral. My whole game was a bit off kilter from there. I didn't do badly, and I didn't come close to winning. Good fun, though. We then played Las Vegas. Although I've done well at it in the past, I've always thought it is a dumb game. And yet, others in my group really like it, so I played it (hey, its been 2 years, what's the harm?). 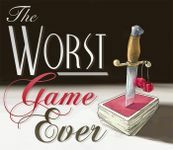 Well, we played it again, I didn't do so well, and I still think its a dumb game. And that was it. Saturday night I watched Incredibles 2 and started Ant Man and the Wasp, Sunday I mostly worked, and now its a new week. On Saturday, we went to a monthly game day at Mike’s house. _9_ Notre Dame - This was with me, Phil, and Andrew; Phil was new. We originally had 5 for this game, but Ken showed up right as we opened the box, so we split into two 3’s. Fortunately, this is one of the games that I can teach without a problem. I was up to a fairly decent start, as I was able to get lots of cubes. Both Phil and Andrew got a lot of early points, as Phil was hitting the point building and Andrew was alone in Notre Dame. The Minstrel came up in round 4, and I was ready to move cubes off the cube building, but doing so would make me hit the rat penalty, so I moved them to the hospital instead. Naturally, this was an over-investment in killing rats, but I did hit the points-for-no-rats card. The Minstrel came up again in round 7, and I decided to move three cubes from the hospital to the park (to make a total of 6) instead of taking 10 points. Not sure that was worth it. I focused on points for the rest of the game, but got shut out of Notre Dame again. Finished with 62, which was my worst score in a while. Andrew won. 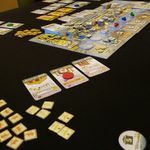 _8_ Le Havre - This was with me, Micah, Jordan, and Steve B.; everyone had played before. We played with the buildings from the Grand Hameau expansion, but honestly these had zero effect on the game--no one bought or used one. This was kind of a strange game, as many of the high impact buildings came out very late. Both Harbors were a little late, the Colliery was pretty late, the Cokery came out two turns before the end of the game, and the Steel Mill came out in the final turn after no one could use. I got into the loan game pretty early, but I ended up being the player least in debt. Micah bought the Marketplace outright in the first couple of turns, and got good use out of it. My buildings were nothing special, I got the Joinery early to make better use of the Marketplace, and I ended up with the Abattoir and the Ironworks. However, I did manage to fish out some end-game buildings too, and ended up with both the Docks and the Storehouse. The Storehouse was particularly nice as I was able to take a stack of 26 fish late in the game--yep, that’s 13 points. It also made up for me only being able to ship once. Jordan built the Cokery very late in the game and I jumped in it immediately and stayed there for an extra turn while I took those fish, which frustrated Micah a bit. In the end, my fairly conservative play won it for me with 162 points. 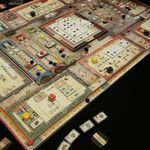 _8_ Teotihuacan: City of Gods - This was with me, Anni, Mike, and Steve B.; only Anni and I had played before. We were playing with all of the non-randomized components. My first priority in the game was unlocking my fourth die, which I ended up doing pretty early. After that, I thought I’d get the techs to get extra resources on the resource spots, and extra temple bumps when I built. Unfortunately, it seemed like everyone else had the same idea, and I could never get the builder bonus, and the pyramid blocks started becoming really expensive. So I kind of transitioned to masks, but I was only able to get four of them by the end of the game. The last part of the game really just involved me selling out to go up the blue temple track and score the end-game bonus. Not sure that was really great, as it was only a straight 15 points and got me a whole bunch of extra resources that I never got to use. In any case, my strategy was kind of a mess here, and I came in last by a fair margin. Mike won going away. I haven't posted my plays for a while and apologize if I reposted some here. I've been traveling for work since Jan.2 to the lovely Michican Upper Peninsula. If you want to see it on a map, my hotel is in Sault Ste. Marie and our test facility is in Brimley. I've been up at least four days every week since, including three weekends which has really limited the playing opportunities. Today, I did get to cross the border for a Keyforge tournament which upped my play count somewhat if not greatly increasing my success at the game. This will probably be my entry for next list, too, but MittenCon next weekend should have some games to write about! 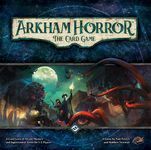 N/A Villainous NEW!I really enjoyed this (and will be placing an order for it this evening based on part of a game. Maybe the biggest draw is that my wife enjoyed it, but I think it has significant decisions as well. 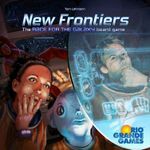 N/A New Frontiers continuing to enjoy this one at all play counts. Still isn't going to replace RftG, but glad that I have it in the stable. Probably going to rate it a 9 when I get around to it. 8 Magic Maze x5 Always a fun time! 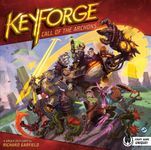 N/A KeyForge: Call of the Archons – Archon Deck x7 Of these plays, one is a win. I'd love to blame it on my decks, but I think that I am probably not playing mine right. I will say that especially today, I saw great uses for my opponents' cards. My new deck (it was a sealed deck tournament) includes a couple of cards that could be really nice if the supporting cards were there. For example, it has the Untamed card that rewards playing creatures, but the deck has only two (possibly three) Untamed creature cards. It also includes one that interacts with Mars cards, but the deck doesn't have any. 8 Key Flow Still liking this one, its rating may go up. 9 Camel Up good game when a plethora of gamers is at hand. 8 Altiplano still on the fence between this one and Orleans as a bag builder. 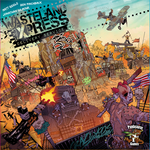 N/A Wasteland Express Delivery Service NEW! really liked this one other than the setup. Edit: I didn't log three poker sessions. That on Tuesdays and Civ V on Sundays are the games that my (work) group plays. And I'm still between laptops, so can't join in the latter. On the bright side I am optimistic that if I am up here on Sundays, there will be something going on at Game Nook II where the KeyForge tournament was.